René Vinson Interiors is an interior design firm that doesn’t just decorate residential and commercial spaces, it creates complete atmospheres suited for every person’s unique taste and style. René Vinson offers a complete array of interior design services from furniture and flooring to supervision of construction and demolition. Each of her clients are extremely satisfied with the level of professionalism and creativity she brings to each home. 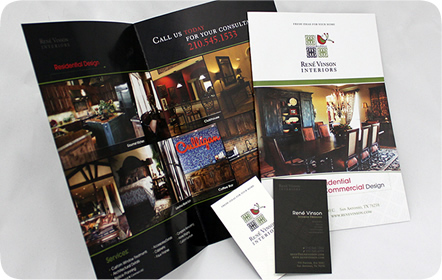 We designed a brochure for René Vinson Interiors to showcase and promote her services. Each photograph takes center stage in the interior of the brochure, focusing on the quality and aesthetics René Vinson can provide to each space. 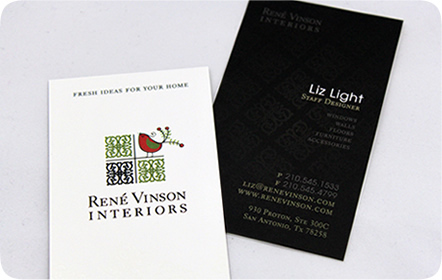 Colors and patterns from the logo complete the elegant, sophisticated look of this information piece.